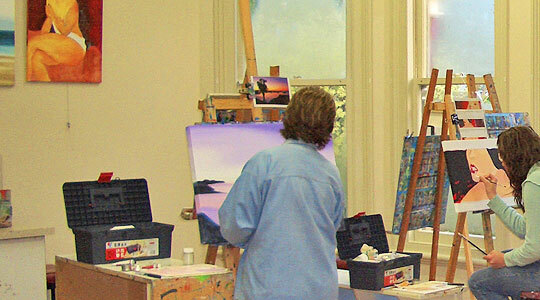 Passion for Painting is owned by Nick Dobson, an experienced artist and qualified teacher. Nick has a background in primary teaching, special needs teaching and is also a qualified occupational therapist. She majored in art under the guidance of John Coley and has an absolute passion for teaching. Nick has created the Passion for Painting philosophy to make sure other people get the same enjoyment from art that she and her teachers do. Come and learn how to paint, or refine your ability. We know art is a peaceful and fulfilling way to relax and enjoy time to your self. We look forward to taking you there. Passion for Painting’s philosophy is to always insure painters succeed at each step of the painting. I do not leave you to flounder on your own, you will always know what you are to do, and why, and what is the next step. I believe that when you succeed, you start to gain confidence and start to enjoy, and so the circle of learning something new goes on. Hence ‘Because you can’ . Once you have got your painting underway, and if I know that I will be working with someone else at the very beginning of a class, there will be a note on your canvas with what you are to do until I get to you.